30, Jalan Nyonya, Kuala Lumpur. Business hours: 12.30pm to 3pm (Monday-Sunday). 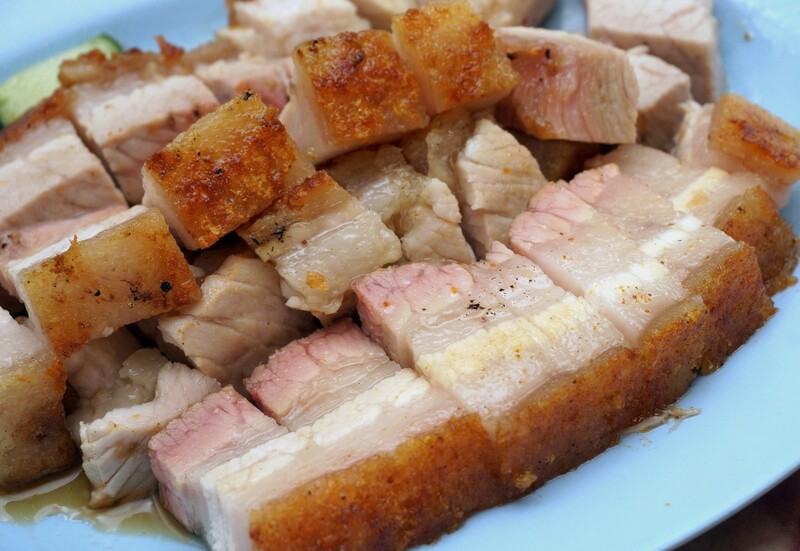 THE Internet comes in handy when looking for good places to have roast pork, popularly known as siew yoke (top pic), as Restaurant Wong Kee comes up the top favourite when you hit the search tab. Ask anyone who has been there and a majority will tell you it is probably one of the best places for siew yoke. I visited this place in Pudu with two friends not too long ago to try their famous offering. It was a Saturday and by the time we reached Jalan Nyonya, there was absolutely no parking space. After three rounds around the block, we finally decided to park a distance away and walked over to Restaurant Wong Kee. 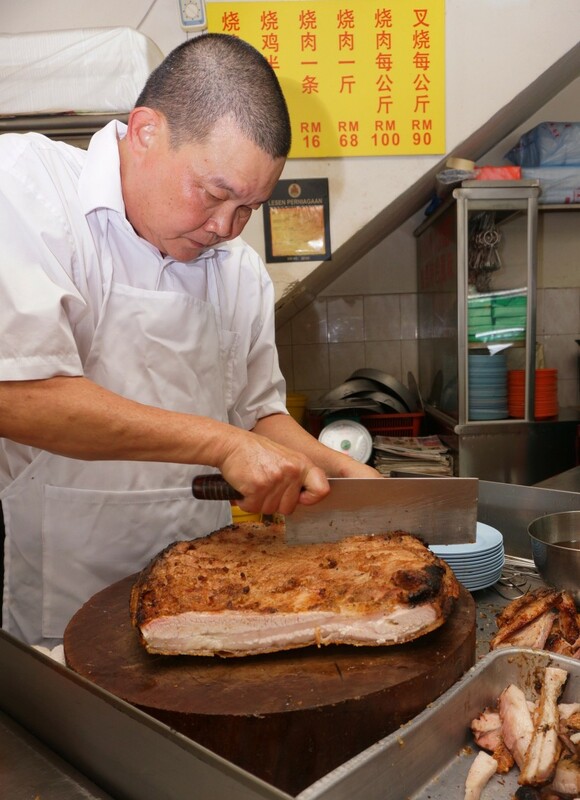 Hard at work: Wong begins serving his famous roast pork at 12.30pm and does not stop chopping up meat until 3pm. Looking for a table was no problem as we took over from a family that was just done with their meal. At 1pm, the restaurant was crowded, with more people coming in and waiting for tables. Extra tables were opened up for those standing but there was still not enough room to accommodate the growing crowd. The crowd that waited patiently was testament to Wong Kee’s popularity in Kuala Lumpur. We ordered siew yoke for three, and waited for a good 20 minutes or so before it was served. While waiting, customers can help themselves to some pork bone soup which was cooked in a big pot with giant pork bones in it. Wong Kee’s siew yoke comes with soy sauce mixed with sugar, and the combination was great with the meat served. When our orders arrived, I was surprised to see how thick the siew yoke was cut. At most other restaurants, the siew yoke serving is sliced thinner. However, I have to admit, I was a little sceptical about the redness of the meat which left me wondering whether it had been throughly cooked. As I had my first bite, I was completely blown away by the meat’s texture, and crispness of its skin. 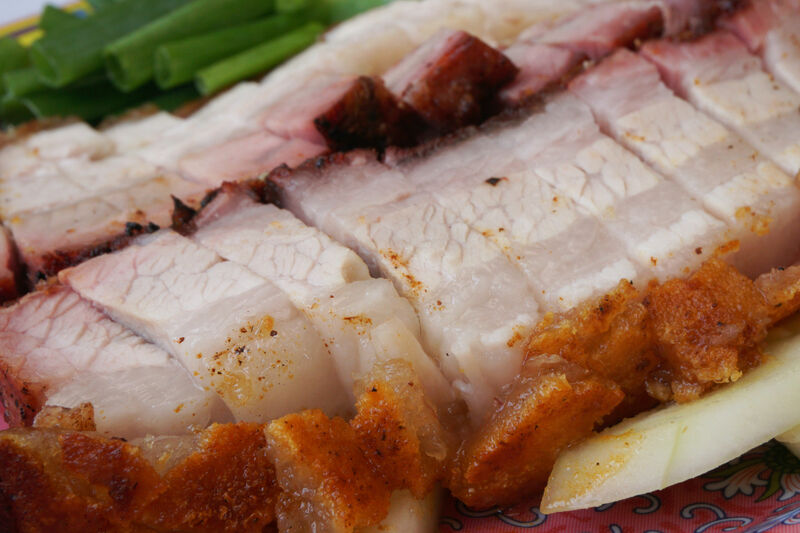 There’s only one word to describe the siew yoke — mouthwatering. I later told my family about my trip to Wong Kee and found out that my dad had tried it before and had only good things to say about the siew yoke. Wong Kee opens at 12.30pm and Wong Meng Kee will not serve you even if you reach there 10 minutes earlier. The bill came up to more than RM50 for our party of three but I felt it was worth the price for good food. Strict with his time, Wong only starts chopping up to serve from 12.30 to 3pm. It may seem like a short time to run a business but Wong does not need long hours to finish up the amount of food prepared. Wong, a 56-year-old who is always smiling, went on chopping the meat as he spoke to me. Just like any story of struggles and success, Wong’s journey into the siew yokebusiness was, as some would say, a matter of luck and talent. As a seven-year-old boy, Wong lost his father and had to find ways to earn money. He began washing dishes for 20sen a day. As he grew older, he did odd jobs to support his family. He said he decided to start his own restaurant, based solely on his own recipe. The restaurant has been in business for 38 years and is only closed twice a month. Every morning at 10am, Wong starts preparing for the day. He roasts about 10 to 12 slabs of roast pork a day, at the alley behind his shop. A slab takes about two and a half hours to cook. Business is undeniably good but Wong sees less customers on Mondays, as more come from Tuesdays to Sundays. Wong reminded me that he only has one restaurant. “If you see any with my name on it, it’s not the same restaurant. I only have one restaurant,” he said. Business hours: 10am to 3pm (Closed on Mondays). You can tell how popular a place is by the reviews online and of course from the crowd gathered at a particular restaurant. A little chicken rice shop in Restaurant Hong Seng in Section 17, Petaling Jaya has been attracting crowds of people for 20 years. At lunch time, you will see a long line of people waiting to either take away or have their meal there. Spicy goodness: Hong Seng Restaurant’s tender and crispy skinned siew yoke is paired with the restaurant’s homemade chilli. When I visited this place for lunch on a weekend, it was tough getting a table and the line was long, not just along the walkway of the restaurant but all the way to the next shop lot. Every time the line shortened, more people would fill in the queue. After waiting in line for about 10 minutes, we finally ordered our meal for four. We decided to try the siew yoke and char siew. Every siew yoke should have tender meat and a crispy top, and those who eat siew yoke should not cut away its fat. 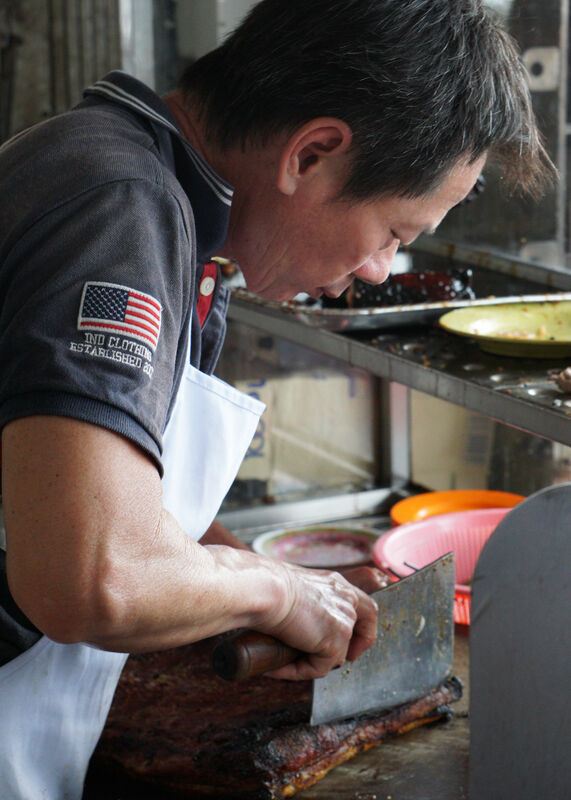 Making the cut: The owner of the chicken rice stall in Hong Seng Restaurant carefully cutting the siew yoke for customers. To me, it is simply a crime to cut away the fat when eating siew yoke. Making siew yoke seems like a difficult task. You need to get the meat tender and not rock hard and the skin must be crispy, which many fail to achieve and produce chewy skin instead. Hong Seng’s siew yoke was not cut as thick as Wong Kee’s but was nonetheless appetising. The meat was tender and its skin crispy but what wowed me was the char siew. Its sauce was unlike any I have tried before. I am sure the regular mixture of spices, honey, hoisin sauce and dark soy sauce was used, but it was sweeter and tastier than most. To add a touch of spiciness to your meal, I would recommend you try their homemade chilli on your meat. Although it was a little spicy for me, the chilli concoction made a great difference to my meal. Our siew yoke and char siew came up to RM46 — a good price to pay especially when sharing good food with a good bunch of friends. A plate of rice with char siew or siew yoke is priced at RM6. Unlike Wong Kee, the stall owner of Hong Seng was not keen to share his story with me. He remains secretive about his business. Although he had many customers to attend to, he looked rather calm chopping up meat and attending to orders.